At the age of eight, Kansas youngsters Neil and Brian (Joseph Gordon-Levitt and Brady Corbet) played on the same little league baseball team. Now, ten years later, the two boys couldn't be more different. Neil is a charismatic but emotionally aloof male hustler while Brian is a nervous introvert obsessed with the idea that he has been abducted by a UFO. When the boys' parallel lives inevitably intersect, the pair unearth dark, repressed secrets on a harrowing and unforgettable journey of self-discovery. Gut-wrenching, gorgeous, intense and unflinching, Mysterious Skin offers a powerful emotional journey you won't soon forget. Joseph Gordon-Levitt transitioned from child star ('3rd Rock from the Sun,' anyone?) to respected adult actor once this film was released. He's incredibly raw and vulnerable in this movie - and also smokin' hot (which doesn't hurt). The new "Director's Special Blu-ray Edition," coming out in time for the film's 10th anniversary, includes an audio commentary, photo gallery, deleted scenes, a special reading of the original novel, audition footage of the two leads, the original theatrical trailer and more! In 1992, Gregg Araki punched the cinematic world in the gut with his breakout feature The Living End, a hedonistic road movie about two HIV-positive men who embark on a crime spree. Since then Araki has been flipping the bird to mainstream culture at every turn. Turning 10 this year, Mysterious Skin, has been his most accomplished and acclaimed effort. Adapted from Scott Heim's 1996 novel, Araki took his most serious turn to that point, taking on the controversial subject of childhood sexual abuse. In the process, Araki proved himself to be a maturing artist worthy of this difficult topic. Set in the heartland hamlet of Huntington, Kansas, the film follows the wildly divergent lives of two young men whose paths fatefully crossed when they were 8 years old. 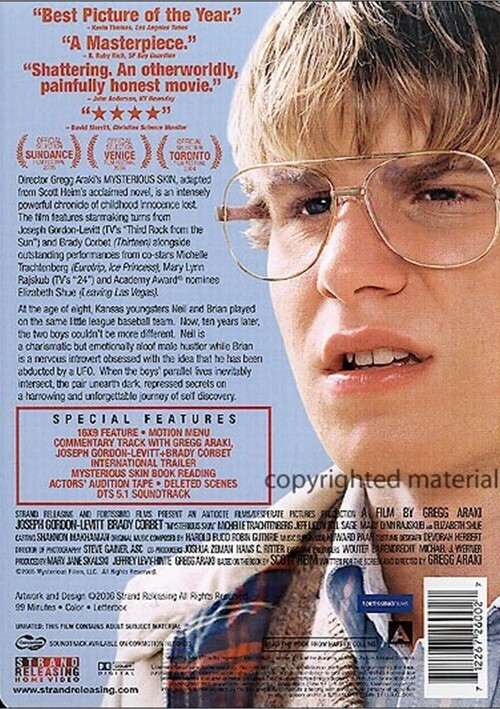 Brian (Brady Corbet) has grown into an introverted 18-year-old whose only knowledge of the trauma is that five hours of his life disappeared - he has become convinced that he was abducted by aliens. Neil (Joseph Gordon-Levitt - delivering a powerhouse performance that helped steer him toward superstardom) has morphed into a gay teen hustler, profiting from the companionship of older men. Neil's wanderings ultimately lead him to New York, where he takes his craft to the next level. Meanwhile, Brian's search for the truth ultimately leads him to Neil. Both young actors turn in extraordinary performances: Corbet's honesty as the gawky, hayseed innocent is palpable and Gordon-Levitt is scintillating as the emotionless, self-destructive Neil. They are surrounded by a bevy of great supporting characters with Michelle Trachtenberg, Elisabeth Shue, Bill Sage and Mary Lynn Rajskub rounding out the cast. In Araki's hands they do a superb job navigating the culturally taboo subject matter. Along with a powerful story, outstanding direction and great cinematic design, Mysterious Skin is a gay indie classic that is poised to stand the test of time (especially now that it's getting a special edition release on Blu-ray). 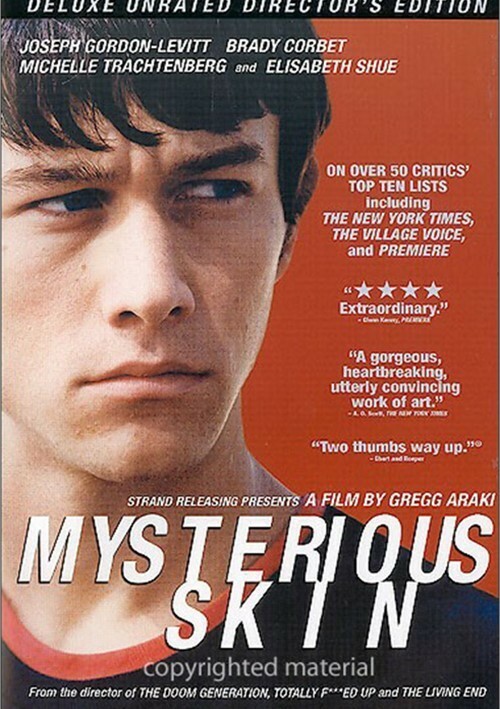 "Mysterious Skin" (Strand Releasing) is not one of those films that you will likely forget about. It is a deep and profound film with a lot to think about. It is exactly what movies are about-transporting to somewhere we do not know and introducing us to it. I am not sure that I would want to be introduced to what "Mysterious Skin" had to show us but I am glad that I was made aware of it. Sexual predators have never been my taste but having seen all of Gregg Araki's work, I had an idea that this movie was going to indeed be an experience Araki took a great novel by Scott Heim and attempted to turn it into a great movie. In many aspects he succeeded. Movies about hustlers and child molesters are nothing new. In the last two years we seem to have had a lot of them. The movie has some excellent performances and some very disturbing footage. We meet Brian who seems to be a well adjusted kind. But he lost five hours of his life to a nosebleed and for some reason he thinks he was abducted by aliens. We also meet Neil who is the opposite of Brian. Neil sees his coach on the first day f baseball and although a kid voices that he has feelings for him. When the coach makes an appearance, it is quite clear to us, the audience, where the movie is going. From his molestation of Neil, the coach sets up the chain of events that the movie will follow. We tune in some ten years later and see that Neil is a gay teen hustler who is anxious to leave the small town where he lives. Brian. Meanwhile, is obsessed with his abduction and is searching to found out what really happened that night. As the movie progresses it becomes deeply disturbing. Some of it is very strong and this is probably due to its candidness. There has been a great deal written about this film-some good, some bad, nothing neutral. In many cases I think for some, the movie hit very close to home. Everyone agrees that it is disturbing. It is brutal but it is real. It is violent and one scene still makes me shudder-the of the teenaged hustler interspliced with child molestation. Did I like the move? I don't know. I am torn-some of it is sheer beauty and poetry while some of it is gratuitous. I had expected much more. Some of my friends raved over. I guess I will just have to watch it again. The problem is now that my mind has already been influenced-in both directions. I have a pet peeve against films that editorialize by straying from or adding to the original story line of a novel (like just about every version of Dicken's "A Christmas Carol"). While it's been a few years since I read Scott Heim's original, I believe this film adheres to the very excellent plot of the book. I also have a pet peeve against reviewers who give away the entire plot! So I won't. Let's just say this interweaving of two very different lives (a gay hustler and a quiet homebody who believes he was abducted by aliens) makes for a very compelling story. Having read the novel and knowing the story ahead of time did not take away from my enjoyment of this film. The movie is well acted all around. Technically, there are a vew spots when the dialog is inaudible. But for the most part production values are top notch. This is Araki's masterpiece! The most powerful and memorable movie I've seen in a long time. Everything about the movie is great--the acting, the actors, the music, etc. The film deals with the long-term effects of child sexual abuse, and sexual addiction, but addresses the larger issue of the human need to connect to other people. While not visiaully graphic, there are some uncomfortable moments involving the young boys and their coach. Get the soundtrack too!